You know this post is helpful just because you’ve realized that using Windows Movie Maker or iMovie to edit your videos is not sufficient enough. I mean they are just to help you out for quick edits, but you really can’t rely on them. However, mainstream software like Premiere Pro and Sony Vegas are too expensive to get your hands on, and therefore you land on searching for posts like these. Fortunately, the editing software that I’m reviewing today is a blend of both – functionality and affordability. The tool Filmora is basic editing software that lets you more than just merging your videos. So without any further talking, let’s start the review of Wondershare’s Filmora. Crofting over hundreds of cinematic effects, transitions, and other professional tools, Filmora is a fully-fledged video editing software for all of your needs. The software offers a simple drag and drops type interface for the whole editing process, so all you need to do is to drag the effect and use it in your footage or raw video. Wondershare’s Filmora is available for both Windows and Mac powered devices. So you don’t need to invest in other expensive software. Though it is a premium licensed software, the company initially offers a free trial version for all the users. 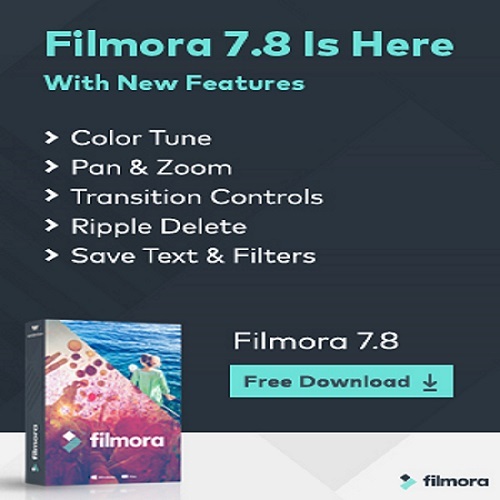 You can download Filmora Trial Version from the official Wondershare website. To get the basic idea of how the tool looks and behaves, I tested out the software for a short video editing project. Yes! I know a bit of video editing as well. 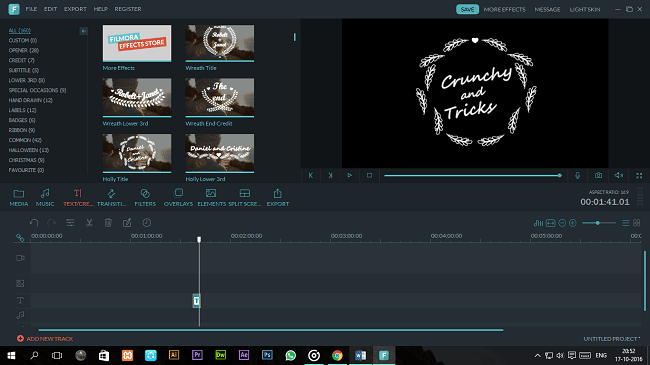 So let’s dig deep into all the features and functionalities offered by Wondershare’s Filmora. 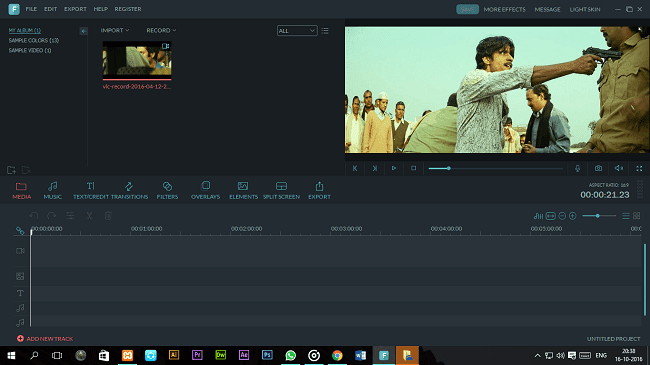 The key to opt for Filmora is that apart from being basic editing software, it has successfully managed to offer extended functionalities while having a modest UI for average users. The developers have kept the user interface fresh, uncluttered and yet have managed to offer adequate access to different features and professional effects of the software. Advanced Color Editing: – Manage temperature, lights, HSL, tint and other essential coloring elements in the video. Give the proper color graded feel to the project with more than 45 presets and color tuning options. Pan & Zoom: – The new and improved Pan & Zoom feature allow you add customized animations, text into still frames and you can even save them as presets as well. Improved Transition Controls, Ripple delete, and a fully redesigned timeline to add texts, effects and another different element over the raw footage. Save Customize Text: – New version supports customize animation, font, size or color of Text effects and save as new presets. Ripple Delete: – Latest version comes with new Magnetic Timeline to create texts, effects, and overlays bound up with clips on the main video track. These and few others are also present in the latest update, so let’s talk more about it in the review. Filmora, the video editing software is fully compatible with all standards the video, audio and image formats. You can also add pretty much any media into your project and. So, once you’ve imported all the elements that you want to insert into the footage, and then it’s just a matter of simple here and about. In just 20-30 dedicated minutes of editing and you would find a professionally edited movie. The dashboard and the media window host all the enhancement tools and mixing tools. For example, the Title tab and Text merger allow you to add decorative text effects onto the footage. Ribbons, Intro Titles, Credits, and much more with customization options for font size, color, Font type, etc. After you’re done with all the editing and stuff, the tool then allows you the export the project in different options and formats. You can either save the project into the Filmora’s WVE format, or you can export it in a specific file format like MP4, MOV, AVI, FLV, MKV, 3GP and other Smartphone & Tablet options. The video is exported can be saved in different resolutions as well, like standard 1280*720p HD or Full HD 1080p. You can also save the finished project and directly upload it to YouTube, Facebook or any other platform. Talking about the features, Filmora has a beastly inventory which is full of proficient tools and performance oriented effects. Most of the features are available to try in the trial version but for a limited period only. However, to experience the full capabilities of this tool, you need to purchase the premium version. I’ll mention the pricing and later in the review. So stay tuned! Standard Editing Workspace: – Filmora allows you to edit the footage and view the changes using the frame by frame preview options. Play the video at different speeds and in reverse too. Add different cinematic transitions, lens flares, and other effects in minutes. Custom Adjustments: – With Filmora, you can easily trim and crop different videos. Merge and Trim multiple footages into one perfect final output. Other editing features like brightness, contrast, saturation, and colors can also be customized. Audio Editing: – Apart from video editing effects, this tool also acts a pro audio editing assistance for your videos. Trim, the background music, split the audio, adjusts volume, audio transitions and even adds a voiceover. The speed of the music can also be adjusted as well. Advanced Cinematic Touch: – Filmora has advanced video effects that are only entitled to pro users. You can use Green Screen option; PIP, camera footage stabilization, and Split Screen features are also available. The standard license of the software costs you around $39.99 for an annual license. Moreover, the company has an attractive offer for the lifetime license. The Lifetime License is available for $59.99. You can get more information about the pricing on the official website. Let me know if you’ve liked the product. Filmora is pretty decent software with attractive pricing offers, and you test out all the pro features and cinematic effects in the trial version. Wondershare TunesGO Review: Is It The Ultimate Phone Manager Till Date? 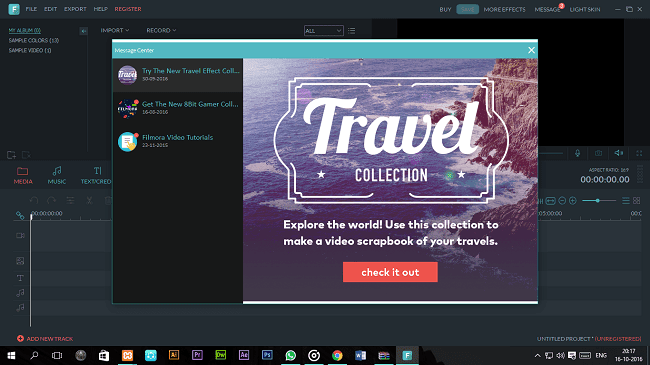 So this was my take on Wondershare’s Filmora, ample video editing software for an average user as well as a pro. Do share your thoughts below and let me know if you’ve liked the review of this fantastic tool. Cheers!